Menswear Spring/Summer 2017 Fashion Week brought us a lot of inspiration from the latest designer runway collections and the streets. The street style was vibrant as ever, with the stylish civilians and visitors of London, Paris and Milan pulling out lively hues, childhood-inspired pieces and a few traditional staples. 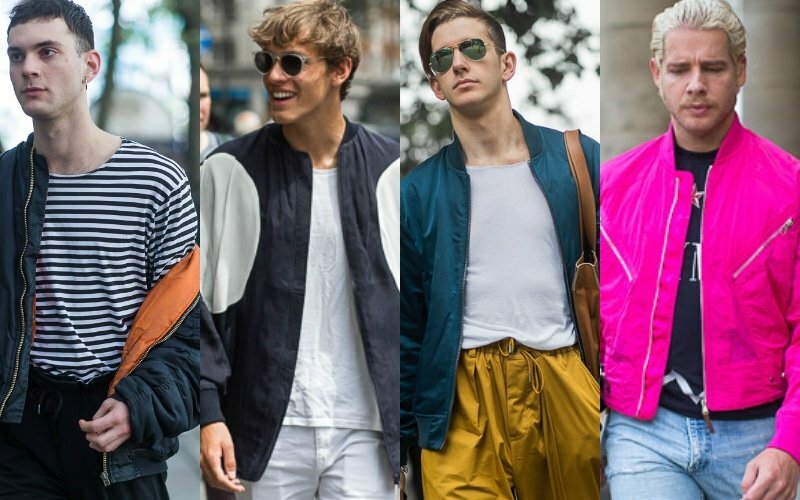 We have searched the streets for the latest men’s fashion trends and narrowed them down to the following most beloved looks and items. 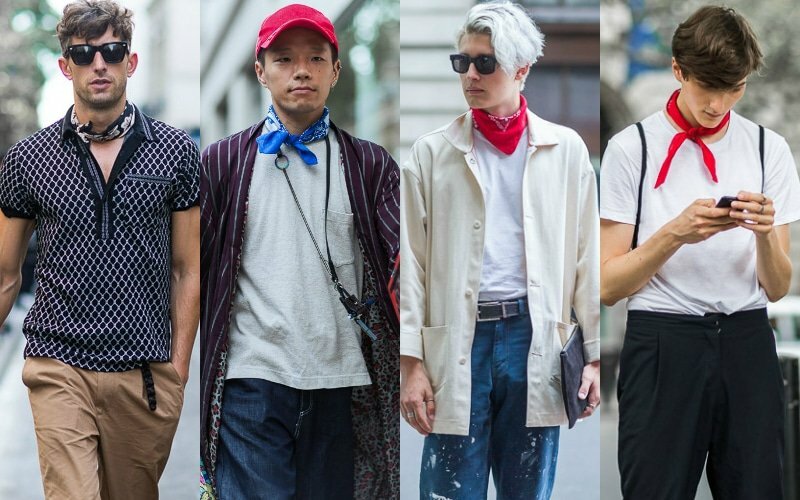 Bandanas are perhaps the easiest street style trend to pull off, and they are boyishly brilliant. What makes this trend even better? All you will need is a humble bandana that could very well cost you a few dollars. An instant boost to the simplest of silhouettes, neckerchiefs are playful and can be an excellent opportunity to bring more colour to your wardrobe if you are a little hesitant to rock brighter shades. A great cherry red, cobalt blue or monochrome patterned bandana will do the trick, but ensure your knots are neat. 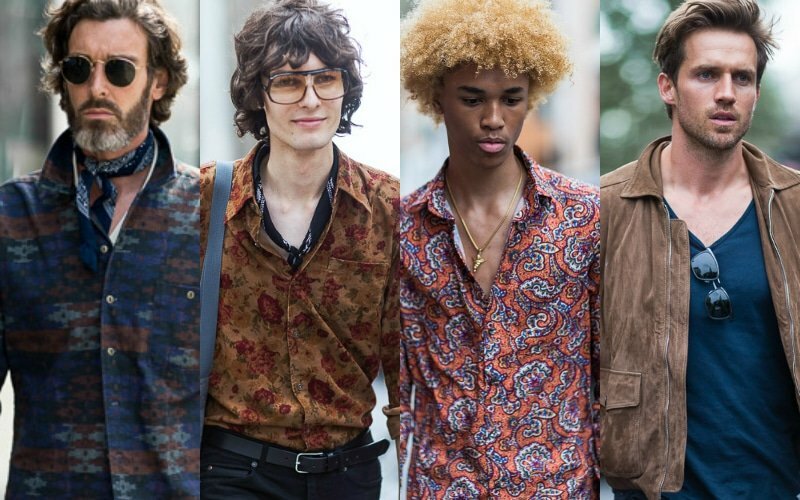 Street Style from Spring/Summer 2017 Fashion Week also saw a sartorial throwback to the evocative seventies. The most appealing element from the seventies trend that emerged from street style was the rich colour palette. Try harnessing a rusty brown or rich Bordeaux as the focal point of your outfits. Loose fitting button downs in gloomy tans or amber oranges are also great. Some attendees also saw the shows as an opportunity to bring out their suede and velvet clothing. The key to pulling off this trend is to find pieces that pay tribute to the seventies, but also complement your features and colouring. Oh, and refrain from donning bell-bottoms. 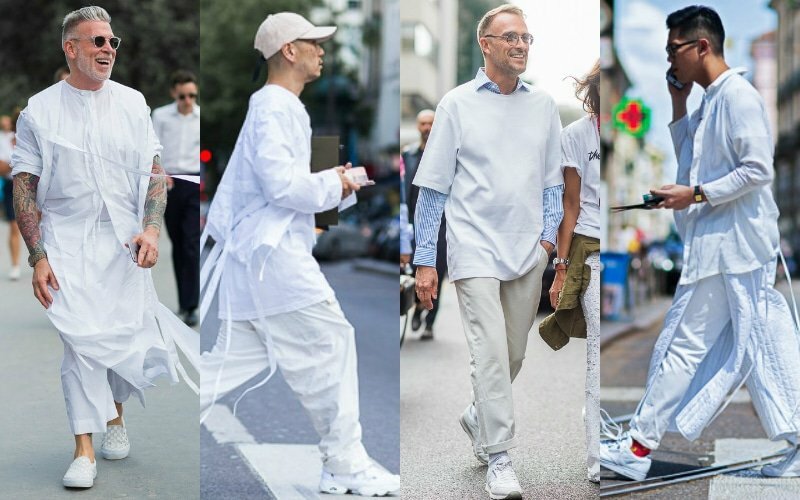 Head to toe white prevailed as a favoured street style trend that was certainly bold. 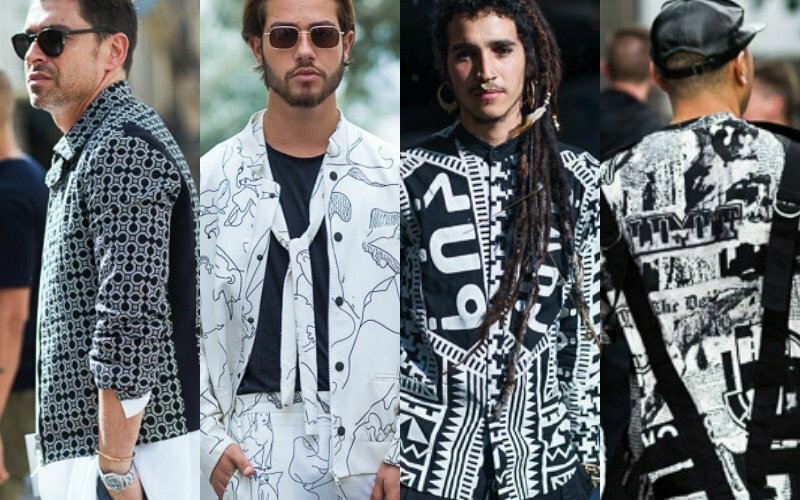 While most gentlemen that harnessed this trend went for more elaborate oriental-inspired silhouettes, there are simpler ways to channel elements of this trend for your weekend wear. Team white jeans with a humble white t-shirt, but throw on a navy or emerald baseball cap for a more grounded look. Roll up your jeans for a relaxed adaptation of the trend. Throw on some dark sunglasses to bring a bit more dimension to the plainness of all white. 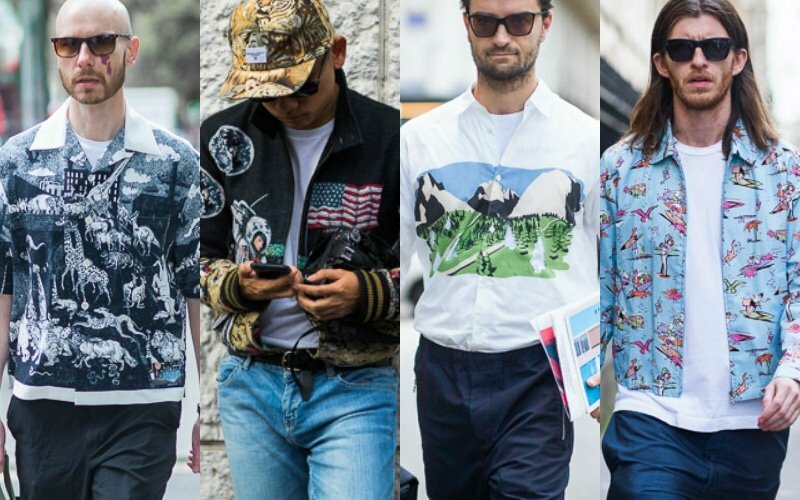 A more playful trend that emerged from the European streets during fashion week was the novel childhood references that were emblazoned on shirts, jackets and baseball caps alike. Gents saw this fashion week as an opportunity to play off youthful imagery. Astronauts, spacecrafts, zoo animals, surfboards, and the like were the fun style statements with references from our younger years. To incorporate this trend in your everyday wear, opt for boyish accessories for a simple boost to the simplest of casual pieces. Think baseball caps, over the ankle knitted socks and youthful prints. Attendees thought outside of the box with the colour choices of their bomber jackets at Fashion Week. 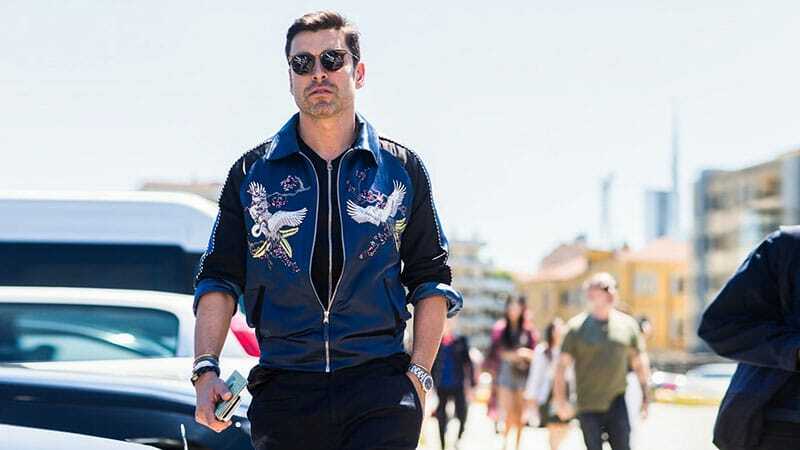 Yes, black and navy bombers featured prevalently in street style, but bolder, more vivid shades also played a major role in distinguishing attendees from other guests. Light-toned emeralds and bright pinks were unexpected and were attention-grabbing. For gentlemen wanting to keep things conservative, opt for versatile colours, but ensure that your fit is youthful, and your accompanying pieces are streamlined. What’s not to love about a great pair of pyjamas? This trend is yawn inducing but in all the best ways. We can thank the attendees for showing us that there is a perfectly respectable way to reconcile sleepwear references with our everyday wear. Baby blue teamed with warm beige featured prominently as did striped and plaid pieces in pastel tones. Don’t think you can pull off this comfy trend? Try a loose-fitting chambray shirt in a lighter blue or a striped linen shirt for a simple incorporation of the trend. 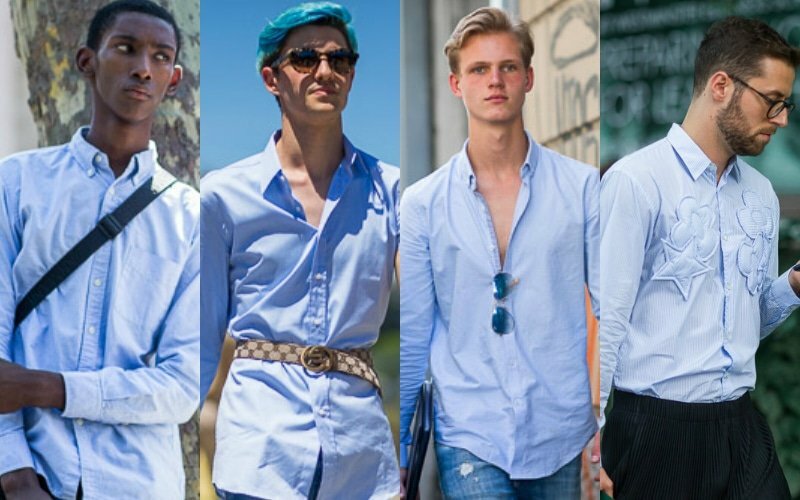 While some gents went for true light blues, others went for more lavender versions of powder blue button downs. Undoubtedly, there was a sea of classic silhouettes, but other powder blue shirt wearers also went for more modern adaptations. These came in the form of asymmetric shoulders, dimensional detailing and skinnier fits. For corporate wear, adapt powder blue shirts with ties in the same colour family; think navy and cobalt. Reds and burgundies are also great colour accompaniments. For casual wear, a great fitting powder blue shirt with streamline chinos is ideal. Team with loafers or white sneakers for a relaxed aesthetic. On the topic of childhood memories, the monochrome prints featured on the European streets of fashion week were a little reminder to our memories of ‘101 Dalmatians’. Bold, graphic and unusual, Fashion Week attendees weren’t afraid to make daring statements in the most humble and basic of all the colour combinations. If you aren’t as brave, incorporate black and white in more traditional patterns, like bold stripes or ginghams which will read more classic yet perpetually stylish. 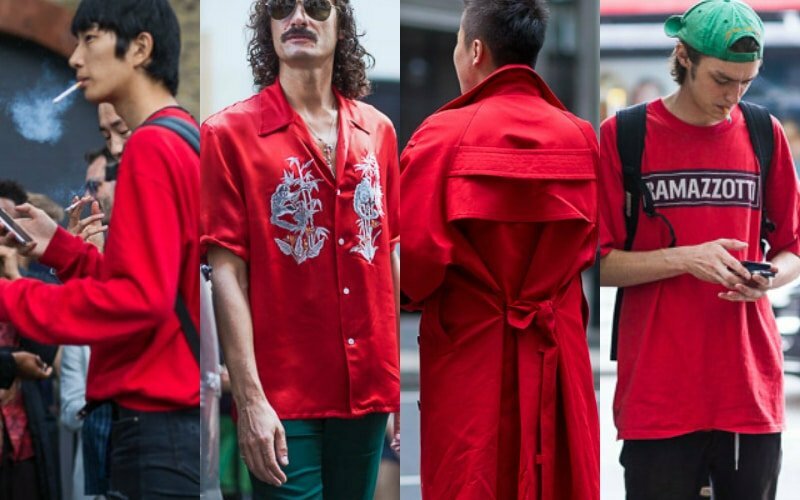 Certainly one of the most attention-grabbing colour trends, vermillion red stood out as a sartorial favourite on the streets of Fashion Week. Be careful to cherry pick which red pieces you go for; this shade of red is very bright and can read conspicuously over the top if done wrong. Vivid red t-shirts can be a nice change to our beloved white t-shirts and red sweaters are a great accompaniment to dark denim. For corporate wear, channel the trend with red socks or a preppy striped tie featuring the shade for a subtle interpretation of the trend. 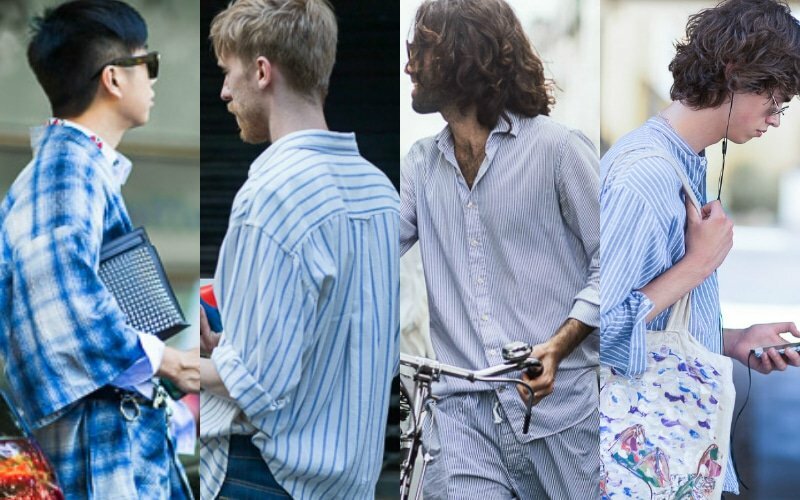 Light blue was certainly a preferred colour of choice on the streets of Europe, with the powder blue trend sustained with the favoured denim for the Spring/Summer 2017 Fashion Week attendees. Light and bright were the denim jackets that featured heavily on the European streets. 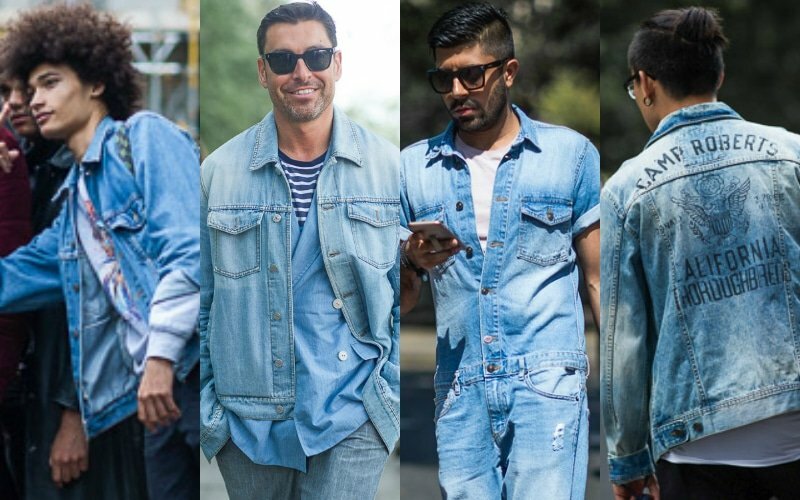 The light wash denim trend didn’t stop there, with some guests interpreting their light wash denim in edgier pieces, including light denim short sleeve mechanic coveralls and distressed jeans. The ultimate for casual wear, invest in some slightly baggy denim jackets for easy over the shoulder accompaniments to white t-shirts or striped sweaters.